As President Obama is expected to make a decision on the Keystone XL pipeline sometime in the next two months, environmental activists and concerned citizens are making one last push against the proposed 2,148-mile pipeline that would carry 800,000 barrels of tar sands oil per day across the United States. Students have organized protests and acts of civil disobedience in cities across the US. On Sunday, a thousand students gathered in Washington, DC, for an action they called XL Dissent. Many of these students traveled from places as far as Minnesota, Michigan, and even Canada, packing into rental vans or friends’ cars for the long, cramped trips. Their sleeping accommodations were on the floor of a church, which opened its doors to them at 11:30 PM and forced them to morning mass at 7:00 AM. Despite the lack of sleep, the students showed up promptly at 10:00 AM for a short rally at Georgetown University to begin their day of action. They then marched two miles to the White House. After arriving, the activists gathered in the park across the street from the White House to listen to speakers, which included an activist from Michigan who experienced the dangers of these pipelines first-hand when a 40-foot pipe segment in Kalamazoo ruptured and spilled 877,000 gallons of tar sands into the Kalamazoo River in 2010. 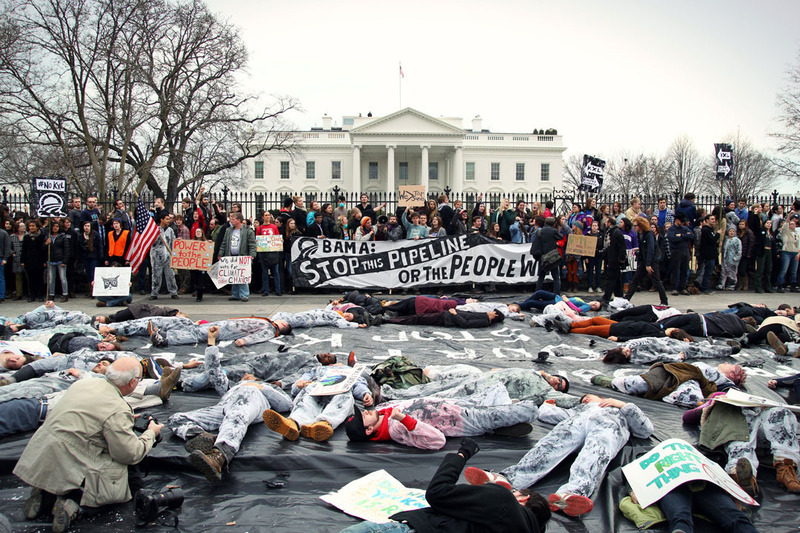 Although the speakers spoke persuasively about the issue, many of the students didn't wait around for the last speaker to finish before they began swarming the front of the White House for an act of civil disobedience. A police officer announced that people must be moving at all times while protesting in front of the White House, and that anybody who was stationary was subject to arrest. After several warnings to leave, police officers began arresting the young activists. All in all, 398 people were arrested over the course of the day while attempting to focus attention on the threat of the pipeline.